I especially remember one particular match,; 1996 US OPEN Quarter-Final between Pete Sampras and Alex Corretja. Pete Sampras actually entered into the match with a stomach bug. 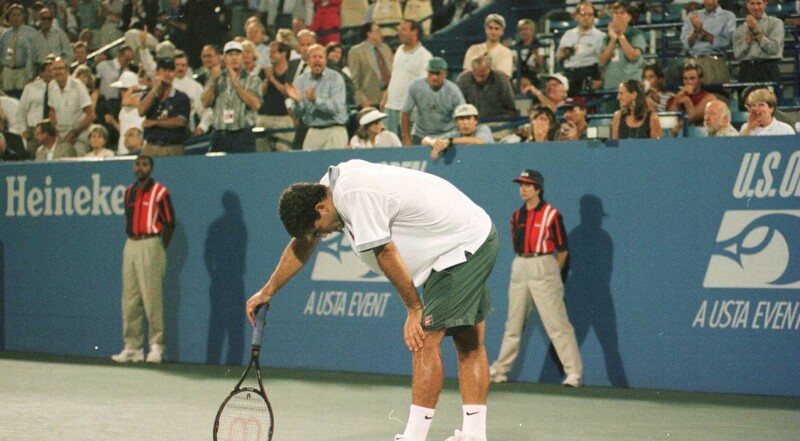 Four hours into the match, and reaching a tie-breaker in the 5th set, Sampras was extremely dehydrated, exhausted, and stomach bug acting up. At 1-1 in the 5th set tie-break, Sampras literally vomited at the back of the court, received a time delay warning by the umpire, but he still continued with the match; determined to hang in there, while barely able to stand still. The opponent Corretja wasn’t making it easy for the great champion and kept playing hard. The tie-break went to 7-7, and by that time Sampras just looked extremely drained, serving at a measly 76 mile /hr. And suddenly, you could see it in Sampras’s eyes, the sheer determination and will, and suddenly, he served an ACE off the SECOND SERVE. Pete Sampras not only went on to win the match, but he won the overall tournament (1996 US Open Grand Slam). One of the most notable feature common in all of the great champions is that almost all of them are quite humble, in personality. Feel free to share your most favored memory of such champions. Check out the smooth gameplay and exquisite graphics in the latest Fifa 16. This was an intense encounter between rivals Real Madrid and FC Barcelona and the lone wolves Messi and Ronaldo.